Loulie R. Anderson, Hibiscus. Watercolor, 16 by 20 inches. Loulie Anderson was one of Tampa’s first professional artists. Anderson moved to Tampa from Mississippi where she was director of the art department at Synodical College. An early and enthusiastic member of Tampa’s Students’ Art Club, Anderson’s work was shown in the club’s 1922, 1923 and 1924 all Florida art exhibits. Her paintings Rain Across the Lake and Moonlight on Lake Thonotosassa attracted attention. Anderson was a charter member of the Tampa Art Institute and later president. 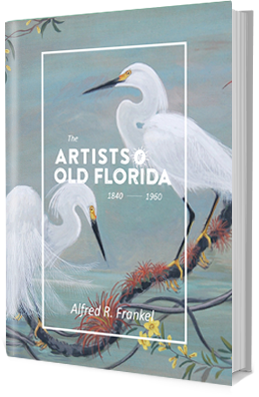 In March 1928 she represented the Institute as a delegate to the 1st Annual Convention and Exhibition of the Florida Federation of Art in Gainesville. Anderson taught art in Tampa for many years and was listed in Who’s Who in American Art, 1953. In 1958 she accepted a teaching position at Thornwell School in Clinton, South Carolina. Born: March 14, 1887, Brownsville, Tennessee. Education: Art Institute of Chicago; with Wagner, Innes; Ringling School of Art; with Fred Yost. Membership: Florida Federation of Art ,secretary; Gulf Coast Artists Group; Students’ Art Club; Tampa Art Institute, president; Clearwater Art Museum; Southeastern Art Association. Exhibits: Students’ Art Club, Exhibition of Florida Art, Tampa Public Library, May 2-May 9, 1922, Sunset on the Bay, In the Heart of the Pine Woods, Moonlight on Lake Thonotosassa, Old Oak in Moonlight, Grey Moss, Old Oak Tree, Old Spanish Trail to Tampa; Students’ Art Club, Exhibition of Florida Art, Tampa Museum of Art, March 12- March 19, 1923, Rain Across the Lake, Moonlight on Lake Thonotosassa; Tampa Art Institute 3rd Annual, City Hall, March 26, 1924, Moonlight on Lake Thonotosassa; American Association of University Women, Tampa Branch, February 1931, Tampa Chamber of Commerce; Gulf Coast Artists Group, 1950, 1951; Clearwater Art Museum, August 1950; Clearwater Art Museum, 16th Annual Members Show, March 20, 1950, Arthur Yahn Award; Florida Southern College, 1952; Pan American Art Exhibition by Tampa artists, sponsored by Tampa Women’s Club and Pan American Commission at the University of Tampa, March 1953, 1st prize, El Columbia Patio.